Advanced Analysis are basically Analysis for comparing and measuring multiple Projects. 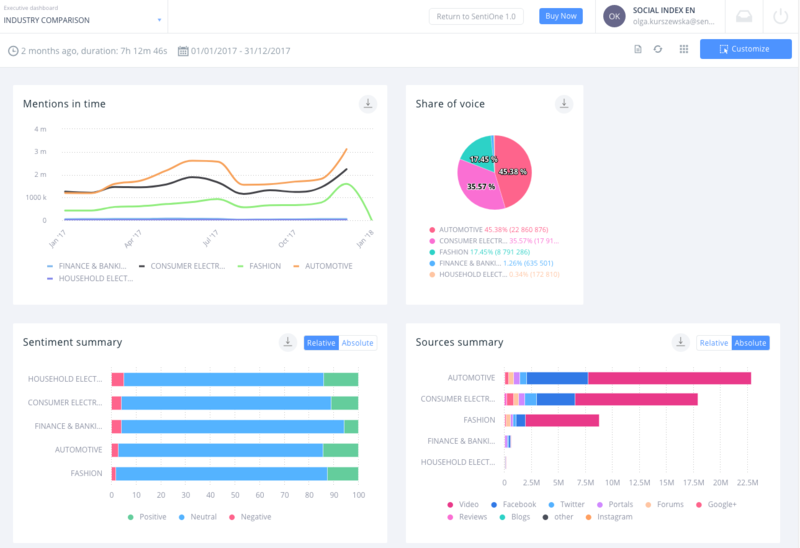 This means that if you have many projects of your online listening and you want to get the overview of how they affect each other, you can analyse and categorise them by monitoring language, type, brand, segment, etc. This way you can get the results of online listening for the entire industry or market. Think what you want to compare i.e. your brand awareness in Europe, comparison of mobile phone producers, top brands for beauty industry, influencers in your market, etc. Create attribute category or categories and add attributes ie. Brand -> Samsung, Apple; Car Segment -> A, B, C, SUV, Crossover. Create projects and assign attributes to them. Project attributes can be assigned in the project configurator in the bottom section of the left sidebar. Please note that for country comparison attributes are defined automatically when selecting the proper project language. Go to the Advanced Analysis module and click create. First select category that you want to use to compare projects and then the grouping attribute. Note that the preview section shows which project will be in which group. Click create and wait. It can take some time as the system analyses millions of bytes of data. Progress is visible on the Analyses list. Once the results will load, they are stored so from that moment on the results should load immediately. How to create categories and its attributes? Go to Projects - this is where you can see a list all your projects created in SentiOne. Click: Show categorized attributes - new tab will be opened automatically, where you can see all the categories created already. Click “Manage”. This is the view where you can edit particular categories and add new attributes to them. Click “Create” to add new category. How to assign attribute to project? Find “Attribute” section and click “Show”. Choose attribute (click on it) to assign it to Project. What is needed to set up Advanced Analysis SentiOne? Company needs to have access to “Advanced Analysis”, “project attributes” and multiple languages/countries. Tom runs a popular blog about the automotive industry and wants to analyse markets of different countries (Poland, Czech Republic, Slovakia, Hungary, Romania, Germany, Russia). First he configures attributes that define every car, as for example segments (Attribute category: segment; attributes: A - Mini, B - Small, C- Medium, Crossover, D - Large, E - Executive, F - Luxury, SUV), producer (Attribute category: producer; attributes: Nissan, Opel, Peugeot, Porsche, Renault, Seat, Skoda, Toyota, Volkswagen, etc.) and model (Attribute category: model; attributes: Yaris, Yeti, Ypsilon, Zafira, i10, i20, i30, ix35, Golf, Insignia, etc. ), country of origin (Attribute category: “country of origin”; attributes: France, Germany, Japan, Korea, USA, Sweden, etc.) Then he goes to project configuration and creates a project that defines one car model on one market, he sets attributes that define car model and clicks save. After that he clicks on the button that replicates the project to all other languages. After repeating this procedure for 100 cars he has 600 projects, for which configuration would normally take ages. Women in Germany prefer small cars - Advanced Analysis with selected segment A and B projects grouped by attribute “country”, widget “Gender map”. Kate distributes major brands of alcohol in Poland, Lithuania, Latvia and Estonia. She wants to sign a huge deal and distribute Jack Daniels, but she doesn't know if whiskey is popular in those countries. Kate defines projects for each alcohol type that she sells (Attribute category: type; attributes: vodka, whiskey, beer, gin, cider, wine, etc) on each market (Poland, Lithuania, Latvia and Estonia). Country attributes are created by default so there is no need to define them separately. In which country is beer most popular? - Advanced Analysis with selected beer projects grouped by attribute “country”, widget “Mentions map”. Bob is responsible for managing sales of WD-40 all over Europe. He has his own country manager in each country who answers to him directly. Bob wants to monitor brand awareness of WD-40 in all countries and he also wants his managers to monitor it. However, he does not want his managers to check each others’ performance. First Bob created one project for WD-40 per one country. Then he created one team per country and assigned each of his managers to teams accordingly. He also disabled the option to edit projects by managers, so they won’t bypass restrictions. Now each of the managers can log into SentiOne and monitor brand awareness of WD-40 on their market and they cannot see other countries. Bob can log into the same company in SentiOne and can see the results from all projects. He can also easily verify the performance on each market by creating advanced analysis with projects grouped by country.